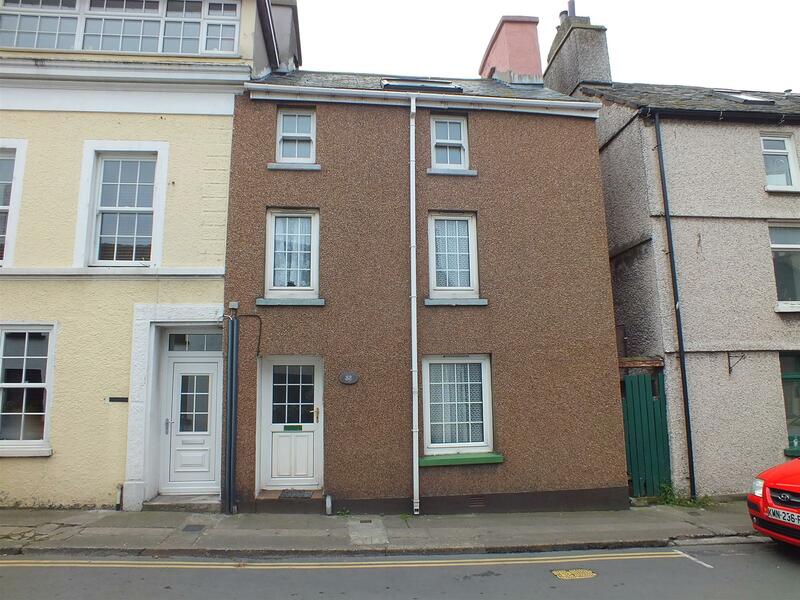 Extended End of Terrace Manx Cottage in the Heart of Old Peel. A Well Proportioned Property in Need of Some Modernisation. Easy Walking Distance to all Amenities & The Public Car Park. Comprising Generous Lounge, Kitchen Diner & Large Sun Lounge. Rear Porch & Cloakroom WC. Excellent Storage Facilities. 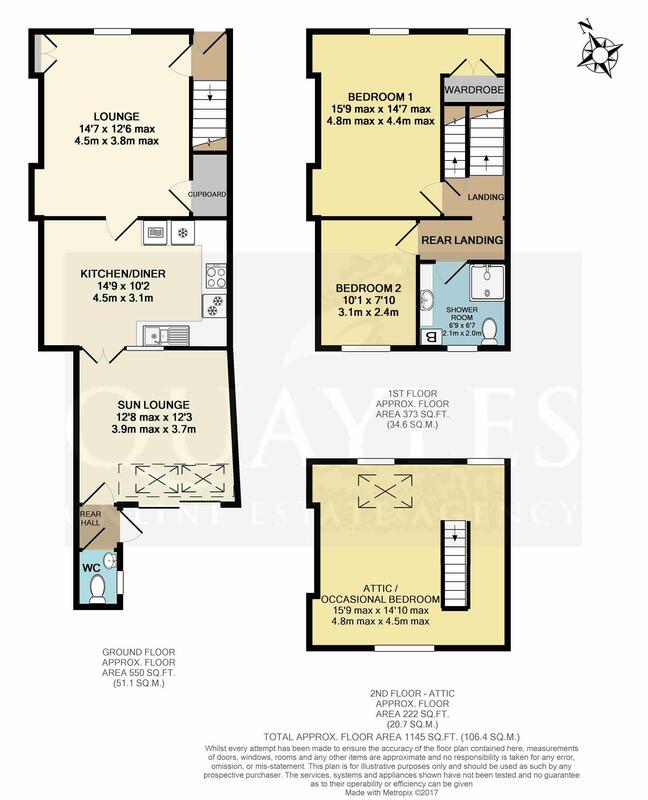 Shower Room & 2 Double Bedrooms, 1 with a Built in Wardrobe. Enclosed Staircase to a Full Width Attic / Occasional Bedroom. Gas Fired Central Heating & Double Glazing (Primarily uPVC). Private Courtyard Garden & Large Single Garage with Lane Access. From Market Place in central Peel, travel along Douglas Street, passing the main car park on the right and continuing up past the Post Office. The property will be found on the right hand side, being clearly identified by our For Sale board. A half obscure glazed uPVC entrance door leads into the hall. Stairs off to the upper floors and a door to the lounge. A high level cupboard houses the consumer unit and electricity meter. Additional circuit breaker installed to serve woodworking machinery in the garage. Smoke detector and power point. A spacious room with a deep set uPVC window to the front. Modern pine tongue and groove ceiling. Fireplace with a tiled hearth and recessed, glass fronted multi fuel stove. Built in cupboard and shelf to one alcove. Four matching wall lights. Telephone point. A good size understairs cupboard with coat hooks, a built in unit, further telephone point and light provides an excellent storage facility. A glazed multi pane door leads into the dining kitchen. A well proportioned room with the kitchen area being fitted with a range of pine fronted wall, base, drawer and glazed display units together with open ended shelving and laminate work surfaces incorporating a 1 1/2 bowl 'Asterite' style sink. Built in electric double oven with an eye level grill. Inset four ring ceramic hob with an extractor hood above. Integrated fridge and freezer. Ceiling spotlight fittings. Background tiling and multiple power points. Vinyl floor covering. Ample space for a table and chairs. Glazed double doors and one step up to the sun lounge extension. A more modern addition to the property with a high angled ceiling and bespoke 'mezzanine' level accessed via a fixed hardwood ladder. Twin, 'Velux' roof windows flood the room with natural light, along with double glazed sliding patio doors which lead out to the courtyard garden. Parquet style flooring. Wall lights and multiple power points. Television point. Door to the rear vestibule. A part single glazed hardwood door leads out to the courtyard. Terracotta tiled floor continues into the cloakroom WC. Tiled to mid height and fitted with a basic white suite of WC and hand basin. Pine fronted wall unit. Obscure glazed uPVC window. Oil filled electric wall mounted radiator. Towel rail. Extractor. Steps up to the rear landing. Door to bedroom 1. An enclosed staircase leads to the large attic / occasional bedroom. Fitted base units with a tiled top and white basin. White WC. Tiled cubicle housing a 'Mira 88' fully plumbed shower. Wall mounted mirror and shaver light. Mirror fronted vanity unit. Obscure glazed uPVC window to the rear elevation. 'Vaillant' gas fired combi boiler. 'Aqualisa' extractor. Vinyl floor covering. A double room with a double and secondary glazed window to the rear providing partial views of Peel Hill. Fitted shelving. An excellent double room with a deep recess accessing a double wardrobe which has been built in under the stairs. Two deep set uPVC windows open fully for ease of cleaning. Understairs cupboard. A superb, bright and airy room with sliding sash style uPVC windows and a 'Velux' window to the front. A large, fully opening window to the rear doubles as a fire escape accessing the flat roof below and offering views to Peel Hill across the neighbouring properties. Modern tongue and groove ceiling. Access to a small, fully insulated attic space. NB The measurement includes the stairs with wooden safety rails. A superb walled garden which catches the afternoon sun. Paved for ease of maintenance. Covered area off the sun lounge. Exterior lighting. A fixed wooden ladder gives access to the flat roof for general maintenance. Concrete steps lead up to a small area planted with shrubs and the entrance to the garage. Having a half obscure glazed entrance door with light and canopy. An excellent 1 1/2 car garage of modern block construction with a pair of wooden doors opening onto a concrete area off the rear service lane. A single glazed panel provides natural light. Fitted shelving. Independent electricity supply with multiple power points and lighting. Plumbed for a washing machine. Please note that although the majority of the concreted area adjacent to the garage belongs with the property a covenant has been put in place to ensure access to both this garage and the neighbours at all times, it is not possible therefore, to utilise the space for car parking. Fitted carpets, curtains and light fittings.